Caesarea Philippi was previously called the city of Paneas. Historically, its terrain included a rocky temple dedicated to the worship of Pan. Votary niches were part of the temple’s landscape. 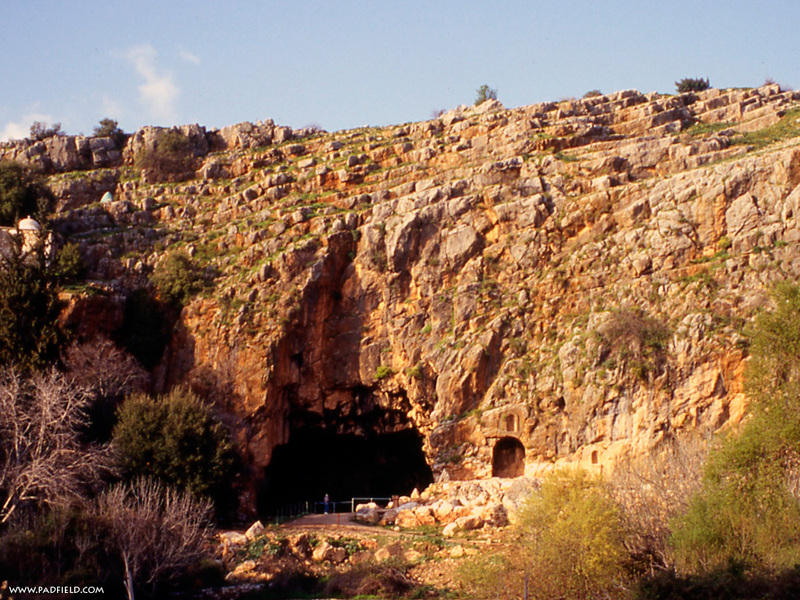 The city was given to King Herod the Great who built a palace honoring Caesar and renamed it Caesarea Philippi. Here Jesus came with the disciples and talked with them in this rocky community. Unlike the worship of Pan, the Church continues its worship of Jesus. Jesus is the unrivaled Lord of the universe. One day to Him every knee will bow and every tongue will confess that Jesus Christ is Lord. This enduring image of the rock is Peter’s confession – Jesus is “the Christ, the Son of the living God.” On the day of Peter’s confession Jesus gave the Apostles the keys of the kingdom of heaven. The Church has been advancing ever since. We can count on it to continue advancing. It will out-last everything else on earth. So many things in our lives do not last for long. Computers, cell phones, clothes and cars have a short life span. Yet, Jesus said, “‘Heaven and earth will pass away but my words will never pass away.’” (Matthew 24:35) What we should treasure are the words of Jesus. We should hold them in our hearts and remember them always. His words are not for us to keep, but to share. With others we should share, “‘Come unto me, all you who are weary and burdened and I will give you rest.’” (Matthew 11:28) With others we should share, “‘For where two or three come together in my name, there am I with them.’” (Matthew 18:20) With others we should share, “‘And surely I am with you always, to the very end of the age.’” (Matthew 28:20) He’s a forever Savior, a forever Lord, a forever friend. A life built on the rocks of Caesarea Philippi does not endure. But a life build on Jesus does. He’s the true Rock!